DBI Sala Trigger2Trigger Tool Lanyard 0.50" x 36.00"
Used in combination with 3M� DBI-SALA� Attachment Points, Trigger2Trigger Tool Lanyards are an economical tethering solution for most hand tools. Pull down on the trigger to open the dual-hooked connector, then release once latched to a tool. 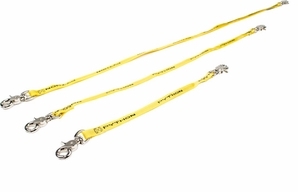 Trigger2Trigger Tool Lanyards come in varying lengths and are load-rated for 10 lbs.